Research carried out at Carnegie details the rich physics associated with how oxide materials transform from insulators to metals by application of pressure. The researchers from Stanford and the Geophysical Laboratory provide the first experimental evidence for LaMnO3 becoming metallic when the Jahn Teller distortion is suppressed. Manganites have been widely investigated since the colossal magnetoresistance (CMR) effect was discovered at the insulator to metal transition (IMT). This effect promises new technical applications in the field of electronic and spintronic devices. However, understanding, and ultimately controlling, this effect remains a challenge because of competing interactions. LaMnO3 is an archetype compound because of the strong coupling between lattice, orbital, electronic, and spin degrees of freedom. High pressure-low temperature Raman spectroscopy measurements, published in Physical Review Letters, resolved the ongoing debate about the nature of the pressure driven IMT. 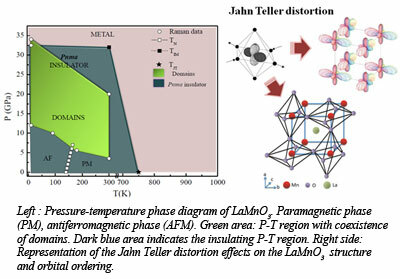 This study provides the first experimental evidence for the persistence of Jahn teller distortion within the insulating phase, and demonstrates that the IMT is connected with the disappearance of the Jahn-Teller distortion. The formation of inhomogeneous domains—some with and some without distortion—was also observed in a wide region of the pressure-temperature phase diagram. A new mechanism for the IMT transition is proposed: the metallization process starts when the breakdown of undistorted to distorted molecules hits a critical threshold in favor of the undistorted. In the recent years several theoretical and experimental studies related the CMR effect to the existence of inhomogeneous and competing states. Therefore, separation into domains opens up the possibility of inducing CMR effect in an undoped sample as LaMnO3 by applying pressure [Baldini et al., Phys. Rev. 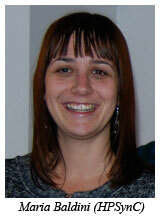 Lett., 106, 066402 (2011)].